When Howard Hinnant is not monkeying around, he is a software engineer for Apple and represents Apple on the C++ Standards committee as Library Working Group Chairman. Howard has is also one of the co-authors / co-inventors of the rvalue reference work for C++09 making move semantics and perfect forwarding practical in C++. 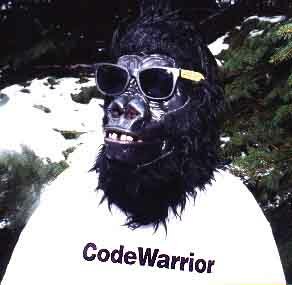 In the past Howard was the principal author of the CodeWarrior C++ library. Howard is married with four children, four dogs (he really isn't that fond of dogs), a rabbit, several exotic lizards with the usual accompaniment of insects (which the lizards are supposed to eat but find more entertaining to turn loose in the house), um... let's see ... fish, wild mice (they eventually kidnapped all the domesticated rodents), several dozen chickens (no I'm not kidding)... The neighbors are trying to turn my property into a federally protected wildlife preserve. They've got a fighting chance ... the kids alone would qualify. When not sitting in front of his computer, Howard enjoys snow skiing and ... more, snow skiing.